This post is part-1 of a series of ten essays on the essence of work. For an introduction, check here. This happens to me when sharing ideas about my work as an event creator, or should I say “créateur d’expériences”, like Renaults famous advertising tag line: “créateur d’automobiles” which is quite different than “car manufacturer”. The elegance of the French language of course helps. I keep on trying to explain that we are not in the events business, that we are in the business of creating high quality feedback loops to enable immersive learning experiences, and my employer keeps calling what we do “events”. I have come to a point where I stop trying to explain, and just do. Part of this “not-getting-it” is probably due to a different (therefore not better or worse) vocabulary used by business people and creative people. But most of the non-connection is there because we live in, are inspired by a different belief system. 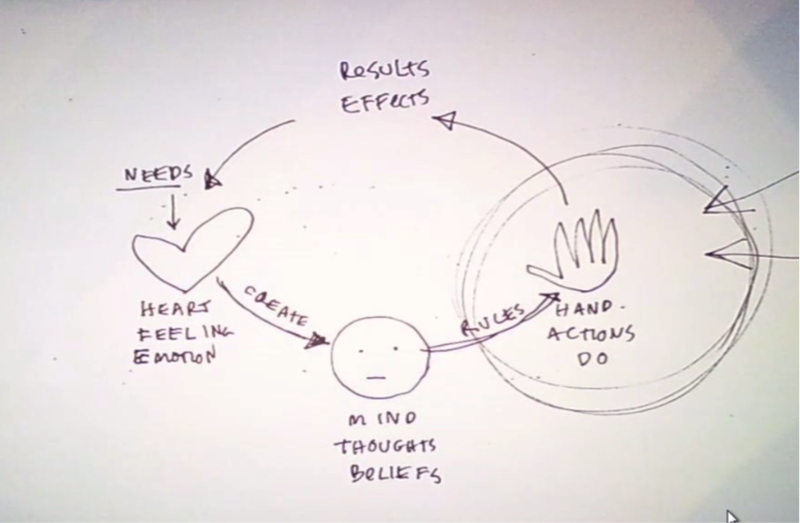 The subject of belief systems really started resonating with me when I discovered a video of Dave Gray’s presentation “Liminal Thinking: Sense-Making for systems in large organizations”, his closing keynote at Enterprise UX 2015 Conference. Dave Gray is author of the fantastic “The Connected Company” and many more, and there is a fair chance that his next book will include “Liminal Thinking” in its title. Dave is a good fried, and he shared with me a preview of his next book. I read it and gave some feedback, so I believe I really have internalized his message. In respect of Dave’s work, nothing in this post is a cut and past from his preview edition, I just distilled it from the public video. The core message in the video/book is that of the “Self-Sealing Bubble”. The bubble of a belief system, the bubble where one is only receptive to the obvious, the belief system, the DNA that the organization has been trained for, and sometimes like in religions, brainwashed for. Where it becomes even more interesting is when Dave starts connecting needs, beliefs and actions. And if my need is not fulfilled, I will create a belief, a story that will give reason for my actions, also called rationalising. asks Dave, and his answer is the mind-blowing “To meet our needs and to help others meet their needs”. Wow! 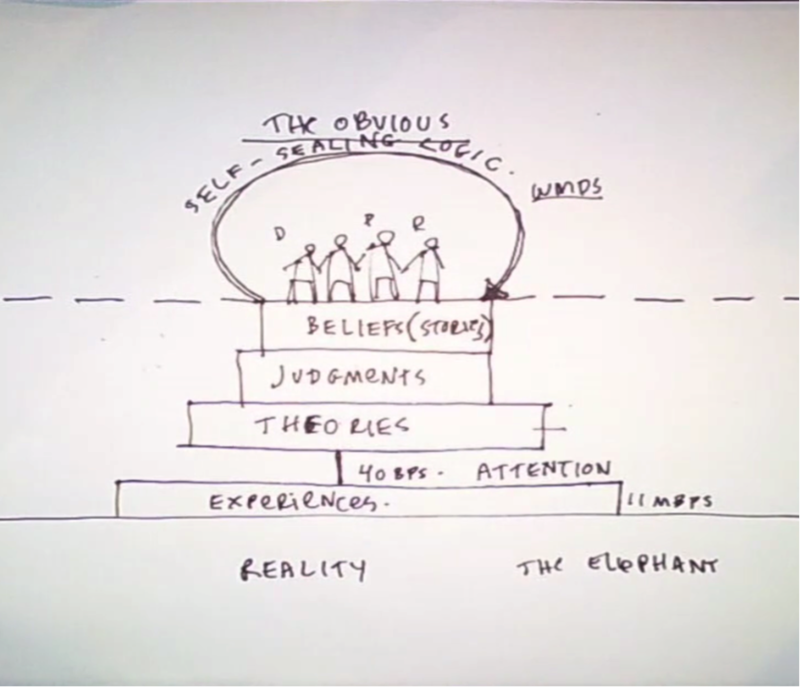 The model presented, can also be used for reverse engineering of needs in case of conflict of belief systems: what would I do if I believed in the belief system of the other party? What would happen if I act as if that belief system were true? What if I would adapt, even fake my behaviour to give the other belief system a chance. But giving the other belief system a chance, is very different than changing your needs. Dave does not recommend you change your needs. On the contrary. And he leads to a very interesting reflection whether security is at all possible at work. An environment where the quality level of “being a group”, being a team is such that there is no competition between team members, where there are no egos, where there are no posers, losers, clueless and Sociopath pathologies as described in the magic post by Venkatesh Rao “Executive Engagement”. Where there no classes and hierarchies, and where everybody is respected for the value and insights they bring to the table. And classes is not only about hierarchies. A class could also be associating people with the past, and isolating them deliberately from the future thinking. An environment without organizational pathologies or self-conforming belief systems. “Most enterprises are not emotionally safe places”, says Dave Gray, and he is unfortunately so damn right. In many organizations, people are encouraged to leave their emotions at the door. It even is more impossible when you get promoted in senior leadership positions, where it really gets schizophrenic, and nobody dares to challenge you. Where most will say yes or whatever latest buzzword to please and charm and schmooze you. But the key lesson learned from Dave Gray keynote for me is to go and search and discover my deeper needs for a healthy functioning of myself in and outside the organization. Because needs inform my beliefs. My beliefs inform my actions. My actions result in effects. And the effect confirm or adjust my needs. That is why in part-3 we will dive deeper into value and needs and how they are the fundamental building blocks of the essence of good work.